Sophie Turner as Jean Grey speaking to Jessica Chastain’s mysterious character. And people in the movie start to blame him for that not realizing what’s actually happening to her. So, yes, he did some things in the past that one could see as dubious but he did them for a good purpose, from his point of view, and so as Jean is losing control and doing these sometimes horrific certainly destructive things, for lack of an explanation for many of the characters because they don’t understand this larger cosmic entity, they are looking at Charles as the one responsible for it when in fact the movie sort of operates on two planes. Perhaps even more surprising is that the mutants Red Lotus (Andrew Stehlin) and Selene (Kota Eberhardt) are set to make their first appearances in the X-Men franchise. 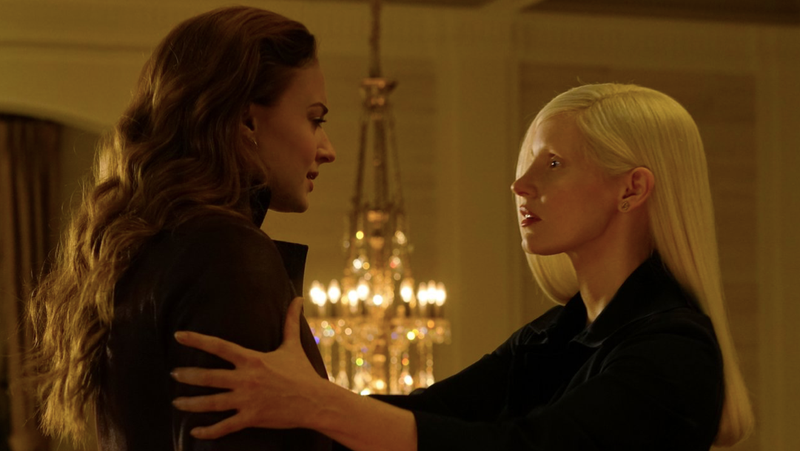 Just how the newcomers are going to be able to hold their own against Jean and her might is anyone’s guess until Dark Phoenix hits theaters next Valentine’s Day.